I would add gender to that list. As a parent, I am, as Boylan describes, “the person I am” and my parenting qualities are really not genderfied. I seek to be the full-range parent to the best of my ability on all fronts. These are qualities of every lesbian, gay or single parent I know. As an LGBT parent, I felt disenfranchised this morning when I got a cheery email from an LGBT advocacy group I support. I want to make one point clear—the disenfranchisement does not bother me for myself. I am confident in who I am, and my kids are phenomenal with the love they express toward me. I am a lucky guy, among the luckiest on earth. My concern here is for my kids and others like them in gay-dad-only, or lesbian-only, -led families. They are the ones left out in the planning, conversations, and excitement over one of these two holidays. They are perceived as the “oh, you don’t have one, and never had one” crowd. They get the message that their family lacks something. It is not true. Most are mothered and fathered, as nurtured and adored as any other kids. They need to be appropriately included in the celebration of all that is motherhood, and in the subsequent celebration of all that is fatherhood, and the people who do each. “It means that I need help right away,” he explained. “You,” he said. And then he planted a big kiss on my cheek before running off. So with that, I would like to send you an open Mother’s Day Card for all LGBT parents, including gay/bisexual/transgender dads. 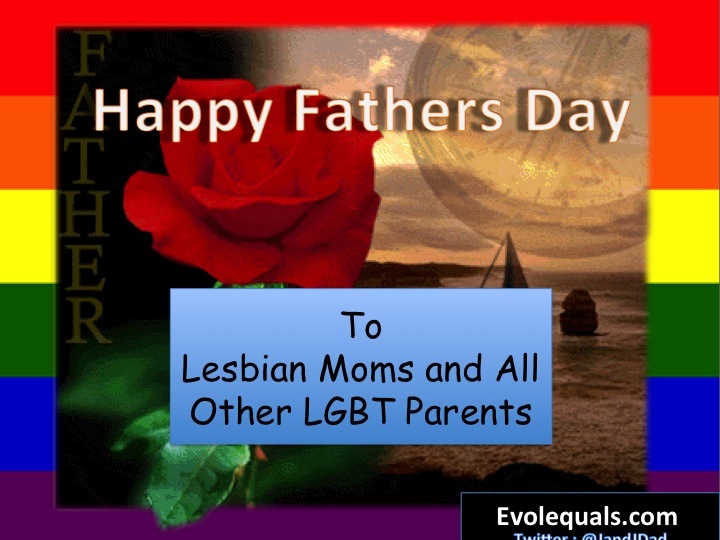 I offer this up as a Father’s Day Card for all lesbian/bisexual/transgender moms, as well. Last, but not least, this is also for all single parents of either gender, and of any sexual orientation. You personify a love that overcomes all obstacles, biases, and inequities. We enter the season that honors the two aspects of your parenting and the love that you bestow to the world. That love becomes realized when you give yourself to your children. You are mothering, in the traditionally understood sense, when you nourish, nurture, and shower affection. You sow the seeds of confidence, vision, and creativity. You are fathering, in the traditionally understood sense, when you protect, guide with principle, instill values, and inspire. You sow the seeds of morality, leadership, and personal power. In the real sense you are mother and father integrated into a seamless parenting whole. During two days in the current months, we honor you, not as the perfect parent, since that entity is truly a myth, but as one who still wants to attain that status no matter how unrealistic it is. We honor you for the days when doing your best, with all good intentions, has to be the way it is. You are magnificent. You are doing the most important work for which humanity can ask. You hold in your hands our future, and you deserve nothing less than dignity and respect at your back. To quote the song, you are “the wind beneath the wings” of life. We thank you. Happy Mother’s Day. Happy Father’s Day. Happy You Day. This entry was posted in Civil Rights, Family, Living, Prejudice and tagged fathering, fathers day, Gay Dad Mothers Day, lesbian moms, lgbt parents, mothering, Mothers Day, Rob Watson. Bookmark the permalink. Thank you for speaking my truth as well. Though not lesbian I was a single mother from the day my husband died leaving me with 2 kids and 4 months pregnant. I was mom and dad, and my kids recognized both. Thank you for speaking this truth. I am a woman, a lesbian, a parent, and I father my child. I am so thankful for you writing this. like you I’ve found many lgbt holding strong to the gender definitions of mom and dad. And just like you, I didn’t teach my child to think of me as a dad. He’s simply always thought of me as such because my parenting style is fathering. Love this and had to reblog!!!! Can we extend happy father’s day wishes to single moms too? I was one for 6 years.